Momentum is building toward breaking down U.S.-imposed barriers against trade and travel with Cuba. The five-day visit to Cuba in early April of seven members of the Congressional Black Caucus provided a push. California Representative Barbara Lee led a delegation including Reps. Melvin Watt, Marcia Fudge, Bobby Rush, Laura Richardson and Emanuel Cleaver. The purpose of the visit, she told reporters in Havana, was dialogue and listening. “We need to actually normalize relations and then the details of what that means would follow,” she said. That the U.S. public supports breaking the barriers is shown by a CNN/Opinion Research Corporation poll released April 10, which found nearly two-thirds favor letting U.S. citizens travel to Cuba, and 70 percent back normal diplomatic ties. Impressed by achievements on display at a biomedical research center, Lee called for scientific cooperation and U.S. sales of medical supplies to Cuba. The delegation met with relatives of the Cuban Five, anti-terrorists unjustly serving cruel sentences in U.S. prisons. 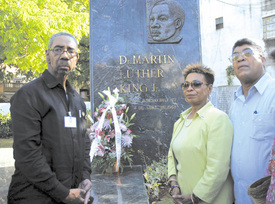 On April 4, the 41st anniversary of the assassination of Dr. Martin Luther King Jr., the visitors placed a wreath before a monument to King in a Havana park. They attended Sunday services at the Ebenezer Baptist Church, part of the Martin Luther King Center, co-founded by Pastor Raul Suarez, member of the National Assembly. They met with Foreign Minister Bruno Rodriguez and National Assembly President Ricardo Alarcon, the latter insisting upon Cuba’s removal from the U.S. list of terrorist nations. On their last day in Cuba, Lee, Rush and Richardson met with former Cuban President Fidel Castro for a session devoted to reminiscing and reflections. Lee said the group will present its findings to House Speaker Nancy Pelosi and White House and State Department officials. Senators Dorgan (D-N.D.), Enzi (R-Wyo. ), and Dodd (D-Ct.), held a well-attended press conference March 31 to introduce S. 428, “The Freedom to Travel to Cuba Act,” supported by 20 co-sponsors. Representatives of the American Farm Bureau, the U.S. Chamber of Commerce and Human Rights Watch participated. The companion House of Representatives bill, H.R. 874, with 121 co-sponsors, was unveiled later at another press conference. Making good on a campaign promise, the Obama administration last week signaled its intention to ease restrictions on travel to Cuba by Cuban Americans and sending money to family members there. Jeffrey Davidow, President Obama’s special advisor on the Trinidad and Tobago Summit, has insisted the topic of Cuba will not be part of the official agenda there. Yet Latin American leaders are coming together in a crescendo of regional pressure to end the blockade.